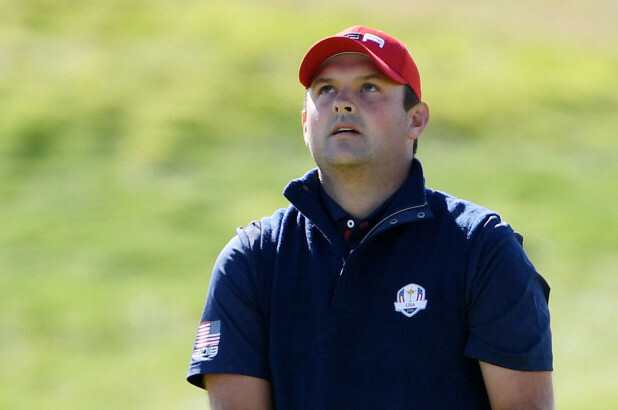 Patrick Reed’s delicate position among his peers looks set to worsen after his comments in the wake of the USA’s resounding defeat at Le Golf National in Paris. The American, who failed to show up as ‘Captain America’ this week, has spoken for the first time since his side’s seven-point loss. ‘Not smart’ was how the Masters champion labelled the decision by team captain Jim Furyk to split the previously successful partnership Reed enjoyed with Jordan Spieth. For Friday’s fourball opener, Reed was paired with Tiger Woods with Spieth being joined by long-time friend and rookie Justin Thomas. The latter pair secured a point as USA opened up a 3-1 lead with the new combination of Reed and Woods the only side to lose in the morning. Reed was benched for the Friday foursomes, a move which clearly irked the passionate star who famously beat Rory McIlroy in their Sunday thriller at Hazeltine two years ago. ‘The issue’s obviously with Jordan not wanting to play with me,’ Reed told the New York Times. ‘I don’t have any issue with Jordan. When it comes right down to it, I don’t care if I like the person I’m paired with or if the person likes me as long as it works and it sets up the team for success. Reed once again joined Woods for Saturday’s fourballs with another loss the result after their rematch against red-hot ‘Moliwood’ pair Francesco Molinari and Tommy Fleetwood. According to sources, Reed was so out of sorts that he sunk a number of balls into the water with his only ball score in the mid-80s. ‘For somebody as successful in the Ryder Cup as I am, I don’t think it’s smart to sit me twice,’ said Reed. Reed beat England’s Tyrrell Hatton in Sunday’s singles for his only point with Justin Thomas beating Rory McIlroy to end the week as the USA’s top scorer. The partnership of Thomas and Spieth secured Furyk three wins from four matches.